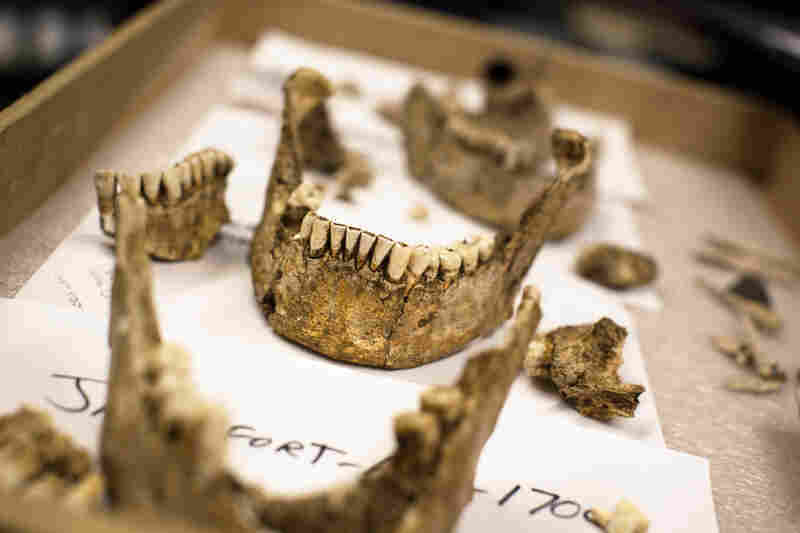 Bones In Church Ruins Likely The Remains Of Early Jamestown's Elite Scientists say remains of four men exhumed from what was once an Anglican church suggest they were well-nourished, "high-status" leaders in the early 17th century colony. And one was likely Catholic. 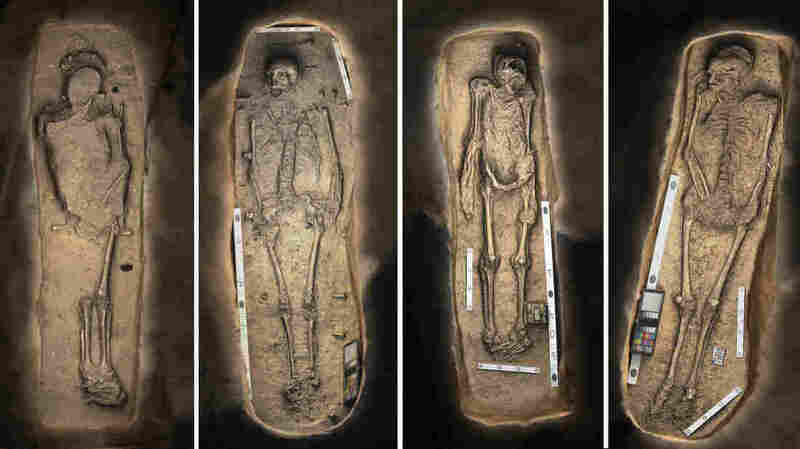 3-D renderings of four skeletons found buried near the altar of an early church in the Jamestown settlement in Virginia. These days, Jamestown is a historical site, where the emerald green grass rolls down to the James River and a steady breeze keeps the mosquitoes at bay. Preservation Virginia, a private nonprofit, runs the site, and Bill Kelso is the project's top archaeologist, with thick white hair and the look of someone who works outdoors in the southern sun. Five years ago, Kelso hit a jackpot. "In 2010," he says, as we stroll out to the riverbank, "we found a series of gigantic postholes." The posts in those holes had been 4 feet square. They had supported a building. From the dimensions, Kelso determined it was the site of the colony's first church, built in 1608. The church was long gone. However, he says, "We could see where there were four burials in the very east end of this rectangular pattern." Disturbed earth looks different, he says, even after centuries. This had been an Anglican church, they knew, and the east end, where the graves were, would have been the chancel — the most holy part, as Kelso tells it. "That's where you'd have the Communion table and the altar and those kinds of things — at the end." To be buried in the chancel, you had to be special. "The chancel is reserved for the really high-status people," says Kelso. "So we decided we were going to excavate these." With help from the Smithsonian Institution's National Museum of Natural History, Kelso and his colleagues exhumed the remains of four men. The bones were in bad shape, and there was no way to identify who they'd been, nor any sign of how they had died. But a plaque near the church site gives some hints — a historical account of what happened at Jamestown, penned in 1607 by colonist George Percy. The teeth and mandibles of four male skeletons unearthed in Jamestown, Virginia, now reside in Washington, D.C., at the Smithsonian's museum of natural history. 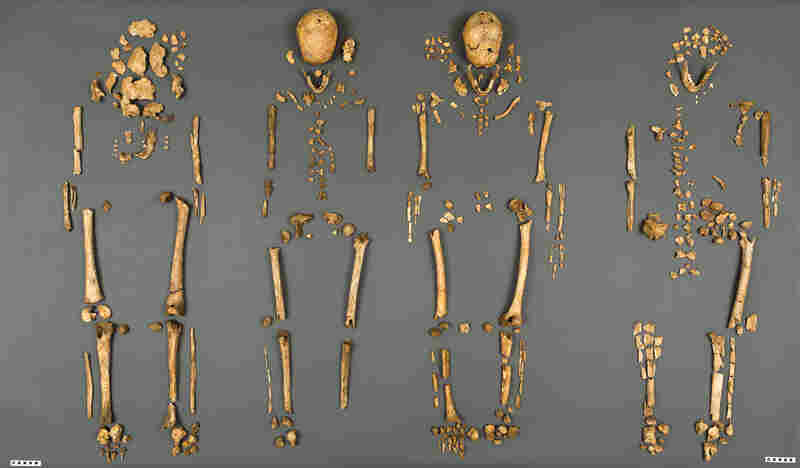 Researchers believe they've now puzzled out the identities of the men: high-status leaders from the first few years of the Jamestown settlement. 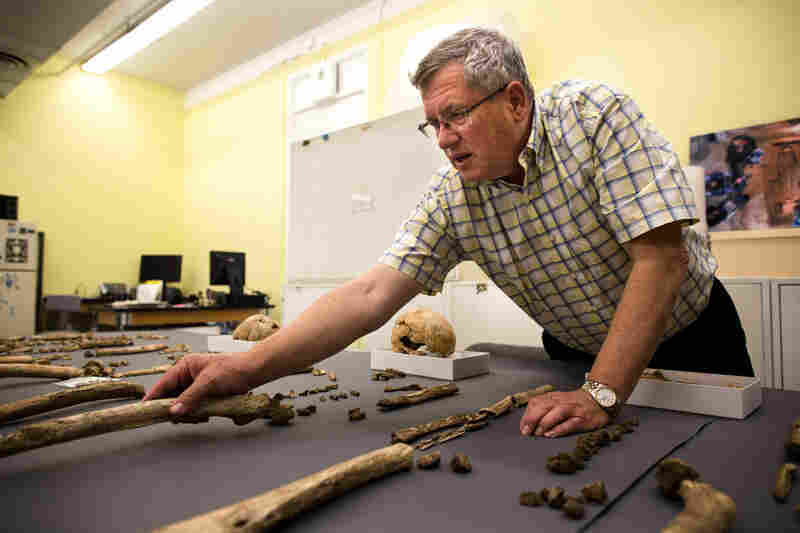 Doug Owsley, a forensic anthropologist at the Smithsonian's National Museum of Natural History, studies every detail of the skeletons. Only about 30 percent of each skeleton was recovered, including these pieces of one man's cranium. 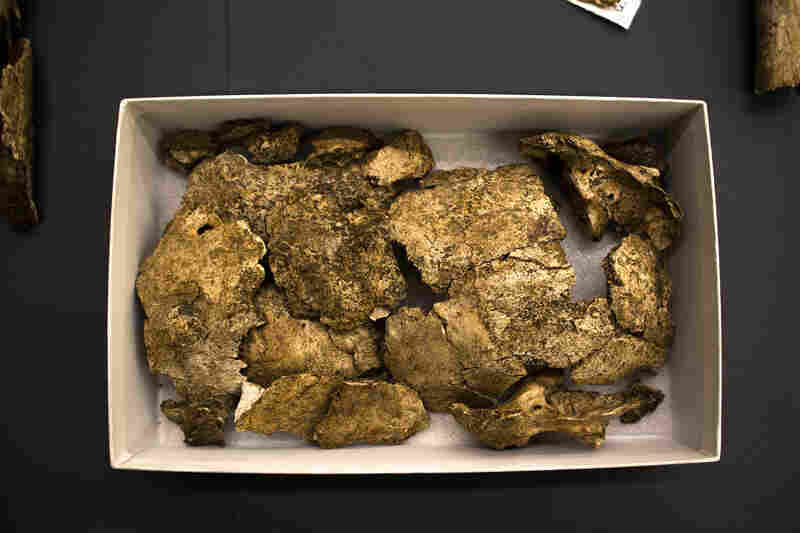 A team of scientists from the Smithsonian's National Museum of Natural History and Jamestown Rediscovery announced the identities Tuesday of the Rev. Robert Hunt, Capt. Gabriel Archer, Sir Ferdinando Wainman and Capt. William West. The long-dead men were leaders who helped shape the future of America during the initial phase of the Jamestown settlement in the early 1600s. Owsley says the teeth of the skeletons show signs of decay that would have been painful when the men were alive. Owsley holds thigh bones from two different skeletons. The one above has a ridge that suggests the man may have had muscular legs — perhaps from riding horses. Kelso reads from the plaque: "Our men were destroyed with cruel diseases, such as swellings ... burning fevers and by wars. And some departed suddenly; but for the most part they died of mere famine." 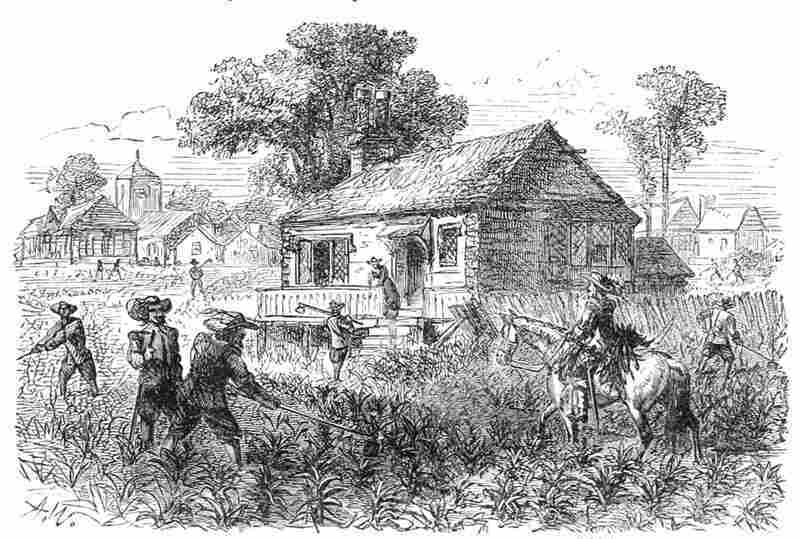 England's Virginia Company had sent the men to America to find wealth. Most died within three years. Life was hell. The church was their spiritual refuge — and part of the colony's reason for being there, according to James Horn, the president of the Jamestown Rediscovery Foundation, a nonprofit affiliated with Preservation Virginia. "It's not just about the commercial," he says of the colony's purpose. "It's about establishing English society in America. And English society without the Church of England at this time is unthinkable." So who would merit burial in the chancel? The graves, it turned out, offered some early clues. In one, the researchers found a silk sash woven with silver sequins. In another, they found part of a staff — the sort a military officer would hold. And along with it, there was an especially intriguing object. Merry Outlaw, a curator of collections for Jamestown Rediscovery, keeps the object — a silver box — locked up in the Jamestown "vault," as the site's collection of artifacts is known. The box is 2 inches long, an inch wide. It had been atop the coffin in one of the graves. Outlaw has seen thousands of artifacts from Jamestown. This one is top of the heap. "It's a 10," she says. "It's unique; nothing else like it." That's because of what's inside the silver box, she says: a tiny lead capsule and some bone fragments (seen only via a CT scanner, after researchers decided the box was too fragile to open). Kelso says the capsule is "a lead vessel that would hold holy water, oil or blood; and the bone would be that of a saint. Put together, this is a very holy object." There's a letter "M" scratched into the surface of the box that holds the capsule. Kelso smiles: "That stands for 'mystery,' " he says. No one knows what the "M" stands for. But the object itself is clearly a reliquary — a container for holy relics in the Roman Catholic Church. And that is puzzling. The colonists were Anglicans — members of the Church of England. Many Anglicans at the time considered Roman Catholics their spiritual enemies. So these were the clues in the dirt. Back at the Smithsonian in Washington, D.C., forensic anthropologist Doug Owsley started work on the bones. One clue: The bones had a lot of lead in them. In those days, people sometimes ate from pewter or glazed bowls and cups, which, Owsley explains, contained lead. People living in that community at that time would all have had some exposure to lead, Owsley says. "But if you're from a high-status family, you're going to get more." That's because metalware was more expensive than implements made from other materials. The bones also showed high levels of nitrogen, which Owsley says indicates these men grew up with a richer diet than most. 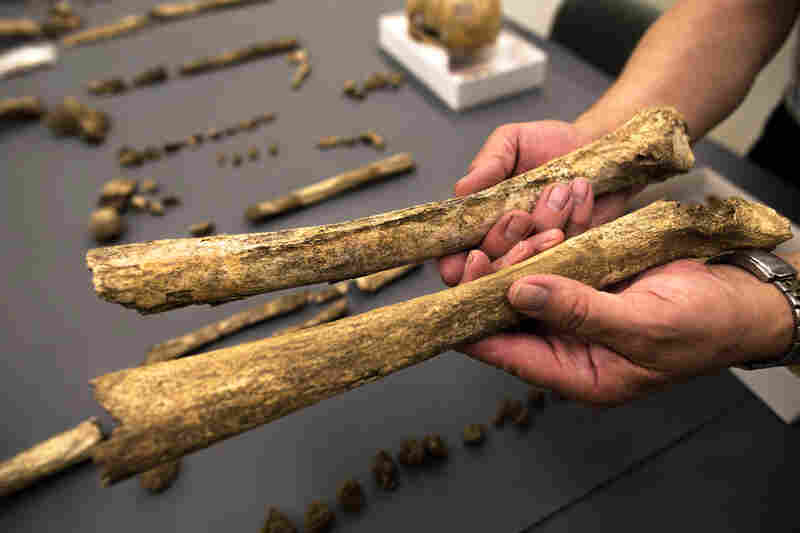 And their arm and leg bones were not as robust as you would expect to find on laboring men — with the exception of one man, who had a thigh bone that showed signs of big muscles. In general, the men were hefty, Owsley says, "but they are not muscled-up strongly. That's characterizing their background and lifestyle." The clues are small, Owsley says, "but we look at all these lines of evidence and tie them together." Capt. William West: He was a gentleman, and a relative of the colony's first governor. West died in 1610 at about age 24, fighting Indians. A silver sash was in his coffin. And, finally, Capt. Gabriel Archer: His family, in fact, was Roman Catholic and, according to records found in England, had been persecuted for failing to attend Anglican church services. It was his grave where the reliquary and the staff were found. Archer was about 34 years old when he died in 1609. These, then, were the elite in this first and most tenuous foothold in the New World. Owsley says the identifications are not airtight — he says he's about 85 percent sure. "We surely don't have all the answers, and we certainly want this to open the discussion and lead to more research," Owsley says. 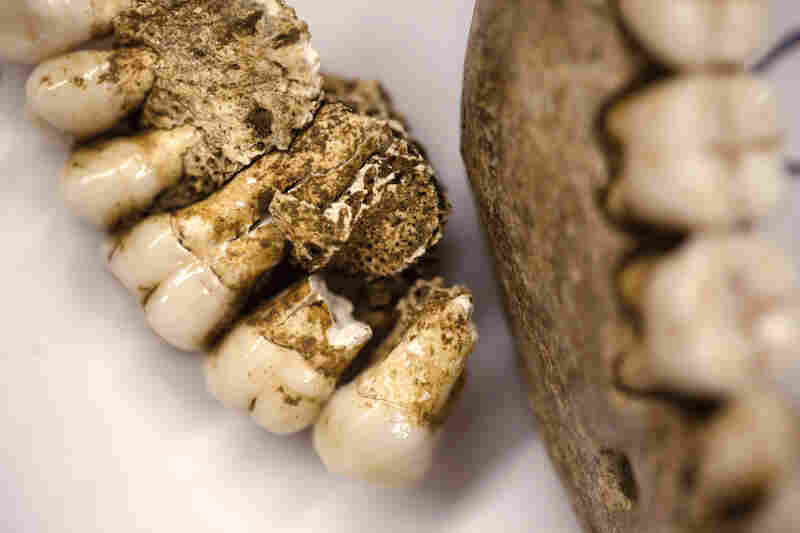 He's undertaking a larger study of early settlers in the region — research on everything from tooth decay to bone shape to bone chemistry — that may help illuminate the lives, as well as the deaths, of the first English settlers in America.